The women in my family are known for many remarkable achievements. From manning flight-control towers to founding companies, and from fighting for civil rights long before it was fashionable to possessing the ability to create parking places out of thin air*, I grew up witnessing just how a woman can do anything she puts her mind to. As a child I was inundated with reassurances that I could do whatever later tickled my fancy, that certainly nothing as inconsequential as my gender should stand in the way of success. Strangely enough though, instead of flying to the moon or spearheading a campaign to save the whales, the thing I found I really wanted to do was the one thing I didn’t see any women in my family excel at: cooking. I’ve already told you plenty about my culinarily-challenged upbringing, but you might be interested to know that the seeds of kitchen discontent were planted long before my own mother started wielding saucepans. My grandmother, a career woman before the term even existed, is not famous in the realm of food (like other people’s grandmothers tend to be) for her cookies, cakes or casseroles, but instead for once forgetting to put the sugar in a pumpkin pie. A voracious eater but an impatient cook, she never seemed to be quite at home in the kitchen. Her cookies were flat and tough, her spaghetti sauce was watery, and the only recipes I ever saw her consult were those on the back of supermarket packages. In fact, when she was in the kitchen I always had the distinct impression that it was never entirely clear who was in charge – ingredients and implements took on a mind of their own around her, and whatever grand ideas she’d had upon beginning were quickly reduced to the reality of whatever happened to come together of its own devices. She cooked not because she wanted to but because she had to, and somehow kept it up long enough to meet the nutritional requirements of a quartet of offspring well into adulthood. But when she finally deemed herself too old to spend large amounts of time on her feet chopping and stirring, I believe a collective sigh of relief could be heard from various corners of the family; for her in particular, I’m sure it was a welcome submission. It thus came as quite a surprise the day, several years after she’d retired from kitchen duty, when she unexpectedly revealed the possession of one great and hitherto-unknown culinary secret: her recipe for apple crisp. It happened one late summer day, on one of her yearly visits after we’d moved to Washington, when I was trying to figure out what to do with a bagful of tart and juicy Granny Smiths. I had been eyeballing a new pie recipe, but was worried I wouldn’t be able to get it done in time for dessert. "Why don’t you make a crisp?" my grandmother asked. When I confessed I didn’t know how, she laughed. "That’s something everyone should know – it’s the easiest thing in the world!" And forsaking her well-worn seat at the head of the table she tottered into the kitchen to show me. First we started by slicing up the apples, thicker than I usually did for a pie. She took a large rectangular dish and laid them out in an even jumble, and then set to work making the topping. "The thing to remember about the topping is that the basic formula is one of everything. One cup of flour, one cup of sugar, one cup of oats, and one stick of butter. Just knead it up like this with your hands until the butter coats everything," – at this point it was resembling sticky globs of garden soil, a far cry from the usual sandy crumble of crisp topping – "and sprinkle it over the top". The moist nuggets were strategically plopped over the apples, and after a bit of last-minute re-arranging to make sure there was nothing exposed, she slapped it in the oven and clapped her hands. "Now wasn’t that easy?" It was. And it was also delicious – so delicious in fact, that I have never found another recipe for crisp that I like better. The topping this method creates is simply the stuff of dreams – it bakes up firm and crunchy, caramelly-sweet, buttery and seductively wholesome, a better partner for silky baked autumn fruit than any other substance on the planet. 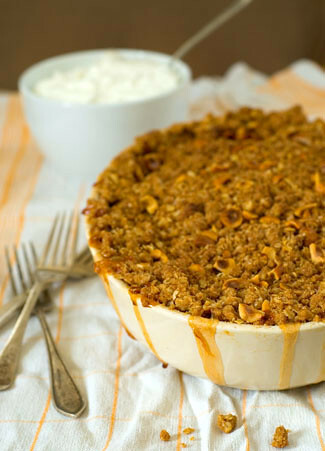 Of course I’ve tweaked the recipe a bit – I prefer to sweeten the apples a little and thicken their juices with starch so that they don’t run the risk of turning the whole thing soggy, and I’ve enhanced the topping itself with a little fragrant cinnamon and crunchy nuts, but the basic formula is the same. I’ve never asked my grandmother where the original crisp recipe came from. I’d like to think that it’s ancient, making the jump from woman to woman in my family already for generations, always being treasured as that one magical recipe that will never fail to impress, delight, or just plain comfort. It will certainly make the journey to my own daughters, should I have any, and I’ll be sure to accompany it with the story of my grandmother, how she would forget to put the sugar in pumpkin pies but knew the secret to a crisp that could make grown men weep. *It’s known in our family as parking karma, and wouldn’t you know it, only the female line seems to inherit it! Notes: If you’re a topping-lover like me, you might find you want to make one and a half times the recipe below – it may seem like a lot but somehow it always fits (and it helps to discourage arguments about who took more than their fair share of topping!). I’ve specified a long baking time and a low oven temperature for the crisp, which I’ve found allows the apples to fully bake without running the risk of burning the topping. Still, if it starts to look too brown on top before the apples are done, just cover it loosely with a sheet of aluminum foil (poke a couple of holes to allow steam to escape). Also, the vanilla in the fruit is a recent addition I’ve been enjoying, but if you want a more traditional apple flavor, just leave it out. Preheat the oven to 325F/160C. Peel, quarter and core the apples, and cut each quarter into thick slices. Combine the slices in a bowl with the sugar, cornstarch, vanilla bean seeds and lemon juice. Mix well and leave to macerate while you prepare the topping. For the topping, combine the flour, oats, sugar, cinnamon and salt in another large bowl. Drop the butter in, and with your hands, start kneading everything together. When the butter is completely incorporated, the mixture should be uniformly moist and quite sticky. Add the chopped hazelnuts and toss everything to combine. them so they’re level. With your hands, sprinkle chunks of the crisp topping over the top of the apples, saving the last bit to fill in any holes. Make sure there are no apples exposed. Position a foil-lined baking sheet on the bottom of the oven or a lower rack (this is important as the juices WILL overflow), and slide in the crisp above it. Bake undisturbed for about one to one and a half hours, or until a knife poked through the crispy crust meets only softness below. Remove from the oven and allow to cool slightly. Eat hot, warm, or even cold. It’s fantastic with vanilla ice cream, whipped cream, Greek yogurt, or my personal favorite – a gush of cold milk poured over the top of a bowlful of piping hot crisp. Melissa,When I make crisp topping I usually double the amount and then freeze half of it. I find having it is handy for making one- or two-person crisps. Melissa, this story is priceless–and the recipe, of course, sounds and looks like it is too! I especially love your idea of adding a vanilla bean. Thank you, m’dear.P.S. Too funny about the female-specific parking karma! We have the same phenomenon in my family, only we attribute it to Sister Mary Gertrude, my mother’s invented patron saint of parking. Don’t ask. When it came to baking desserts, my mother was for the most part hopeless. But, like your grandmother, she made one dessert quite well. It went by the dubious, though traditional, name of Apple Brown Betty, and was basically the same as your grandmother’s recipe for crisp only without the oats. Simple, yet, a great way to showcase tart-sweet apples. Your addition of hazelnuts and vanilla, though, sounds so enticing. I can’t think of any dessert that would warm up a chilly autumn evening more! Yum. I used the same topping for a rhubarb crumble I made on Saturday night. It’s so easy to remember isn’t it? And I’m with you. The crumble topping is definitely the best part. That crisp looks dangerous! I think I would eat the whole thing all by myself if given the chance. Do you know that I’ve never made a crisp before? I should get to work shouldn’t I. The formula will stick in my brain forever now, since its quite simple! I like the sound of adding vanilla to the mix too. i have yet to make a successful crumble of any sort, but in the spirit of never giving up, i’ll give this a go the next free weekend i have! thanks! Hey Crispy-Critter; I’ve been making crisps all week, substituting coarse-ground polenta for some of the flour for an extra-crispy crisp. Nice to see we’re on the same baking wave-length. Love the thoughts on your family – they sound like quite the impressive bunch! I adore crisps, with all the pleasure of a pie, but with the addition of that buttery, crunchy topping. Heaven during the colder months. I must say I admire those forks, they are gorgeous. Tomorrow I’m doing this, my mouth is watering and I will force my children to eat it as well! Lovely story, you told it so well! Yum. My problem with crisp/crumble recipes is that I’ve never written one down and kind of gone from memory… with varying results. The beauty of your grandma’s is that it is easy to remember. I will give it a go! I love the recipe and the story, Melissa. Thanks for sharing them! Hi Melissa,Another wonderful post. I just love it when you share your stories. Makes the food seem that much better. I’m like you in that I would really love the topping on this dessert. Instead, though, I might consider substituting pears instead of apples. How do you think they would taste? Melissa,Back on the subject of keeping crisp topping mix around, I made an apple/ricotta coffee cake a few days ago and used the topping I had in the freezer as a struesel. The recipe is on my site. Hi Reid – I’ve actually made this same recipe with pears instead of apples, and it was fantastic. Basically any kind of fruit will work – berries, rhubarb, peaches, plums – and you can also substitute whatever kind of nuts you like or even leave them out. Let me know how it goes!Hi Rachael – That is too funny, I never thought of the parking karma from that perspective, but it certainly makes sense! ;)Hi Kevin – I was just admiring your coffee cake this morning. Maybe I’ll have to whip up a freezer batch of crisp topping after all! Melissa, I've been slowly reading through your blog from the beginning and wanted to let you know just how much I am enjoying it! I've thought to comment many times, but when I read this story, I knew I had to. I don't think I've ever enjoyed reading anything as much as I enjoy your blog (and I've done a lot of reading over the years!). Your writing is so expressive and just a pleasure to read, to say nothing of all your wonderful recipes! I'm looking forward to catching up on the next few years and hope you'll continue to be prolific so that I'll never run out!